If you've ever had trouble knowing just how big to make your blanket, this is your guide to crochet blanket sizes! No matter what finished look you're going for, it's important to get sizing right. If someone asks for a twin size blanket, you want to give them the exact measurements and not worry about it being too big or too small. You wouldn't want to use more yarn than you actually need! Or what if you wanted to make a baby blanket? Are you going to make a crib sized blanket or a lovey? I've created a guide to crochet blanket sizing for anyone who's ever wondered just how big to make their blanket! 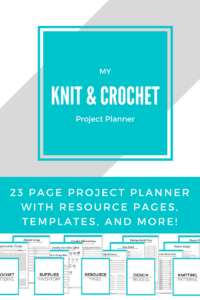 Claim your FREE guide to Crochet Blanket Sizes! Get your FREE printable guide and make perfectly sized blankets, starting today!